​Join us as we journey into Fortnite: After weeks of planning, we are finally able to share the news with you. We have acquired one of the more talented teams in Europe, the Irish Fortnite roster of «Same Gaming»! It's been a pleasure to watch Fortnite grow from a small BR shooter to the biggest game in the world. As fans of the title since day one its hard to not express our joy in finally being able to reveal this to the public, and to you - our fans. ​We present to you the #FACTFN roster! 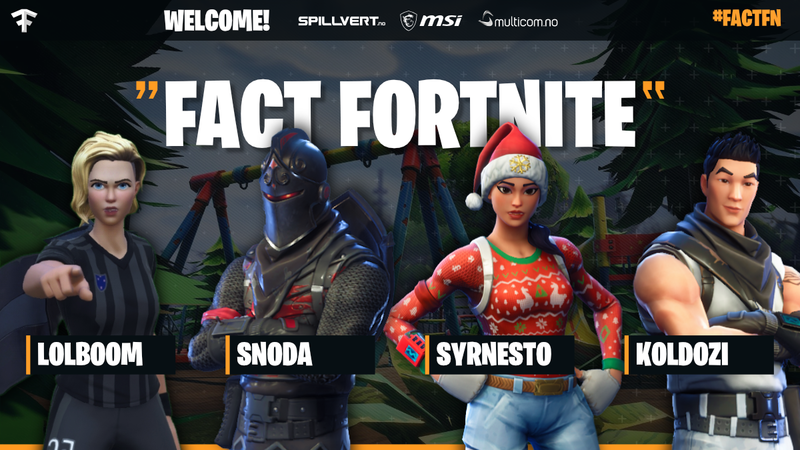 I am very excited to be the Manager of the newly announced Fact Revolution Fortnite team. I am the elder brother of the young star lolb0om and cannot wait to show you all what this team can really do! My favourite skin is the “John Wick” skin. I started playing Fortnite right as the game became free to play sometime in September. My favorite skin is the "Trooper" skin paired up with the "Backup Plan" back bling. I started playing Fortnite around late November. I tried the game out and I really enjoyed how you could build structures, which is something new in a BR game. My favorite skin is the “Nog Ops” skin, I have used it pretty all the time and I like to combo it with the “Black Night Shield” back bling. I started playing Fortnite in early October but didn't really start to play it a lot until mid-November. My favorite skin is the “Black Knight”, which has been my favorite skin ever since the Season 2 Battle Pass came out. My favorite skin is the “Finesse Finisher” with the “Pink Guitar” from Power Chord back bling. I just want to say that I am so happy to have the opportunity to play for Fact Revolution with my squad and cannot wait to prove that we deserve it.